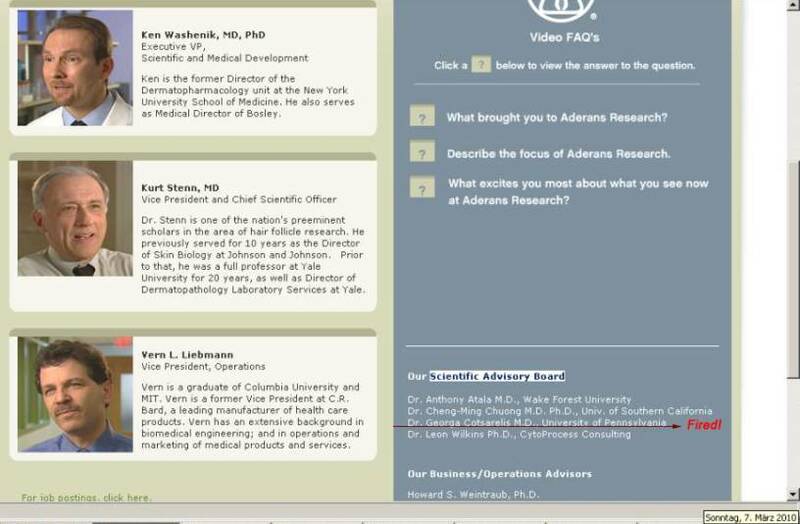 "Aderans Research Institute (ARI) is a leading commercial force in the field of hair regeneration, pioneering innovative cell-based solutions to the problems of pattern hair loss that affect millions of people around the world. Historically, hair transplantation has been limited by the number of available hairs on the head in question, but cellular regeneration may make it possible to multiply hairs, providing a potentially unlimited supply of hair growth for up to 80 million Americans suffering from pattern hair loss. With rejuvenated hair follicles producing healthy hair, people can get back to the business of leading confident, productive lives. We invite anyone facing the challenge of hair loss to consider participating in our clinical study, and we invite members of the investment community to explore our cellular regeneration process in greater depth. " The last paragraph concerns me a bit. They are appealing to investors. Regardless, Aderans has awaken from a four-year coma. They are in the news again and they are making press releases. I will remain cautious since they are still in phase 2 trials. That being said, this is very exciting. A year or two from now, it is possible that we will hear about Aderans phase 3 trials…which would mean they are only one phase away from market. Awesome. From their website, "Experts suggest that a marketable solution is less than a decade away. " » Because, the cure will not be available before the next decade (10 years). » than a decade away. " “We do expect it to be on the market possibly within the next year or two,” Dr. Mizuguchi said. … suggest it to be on the market within the NEXT year (2011) or two (2012). So what ARI is saying is absolutely right! Because within the next 2 years, IS less than a decade away. » get back to the business of leading confident, productive lives. I really hope they are striving for rejuvenation as the text says - that’d be the holy grail of baldness cure! i don’t think a cure will be avaible in the nest 2 years but it would be the greatest news for my life!!! » » get back to the business of leading confident, productive lives. » be the holy grail of baldness cure! Ironman i admire you optimist. it cheered me up. My quote came from Aderan website. “less than a decade”. Also you will notice that name Cotsalis was removed from their website. I guess he is no longuer a consultant. Btw, I do think they are at least 3 years away, because they are still doing phase-II trials in 15 locations now! Me thinks they are still fine tuning their protocol to achieve optimal results and learning more about the process at the same time. Given that they are still asking people to enroll in their trials, its safe to say that the phase-2 trials won’t end anytime sooner than the first half of 2011. After that they’ll proceed with a phase-III, so even if they do a phase II + III styled trial still they’d end up finishing it sometime in 2012. Add about a year of FDA bureaucracy and then we are in 2013. PS. Iron_Man the quote you mentioned of Dr. Mizuguchi sounds like hes talking about a treatment similar to Intercytex’s “proto-hairs”…not the ARI stuff. So everything what is “Intercytex-related” (even the mentioned neogenesis/rejuvenation animation posts above) is now ARI-related as well. AFAIK, ARI only bought assests related to ICX-TRC. Whereas proto-hairs were promoted by Intercytex in one of their last TRC updates, touting proto-hairs as much more viable solution to mpb then DP cell based TRC, as TRC was showing inconsistent regrowth across patients. Plus, Dr. Mizuguchi is specifically talking about growing hair in the lab and “transplanting” them to scalp - like proto-hairs. However, ARI’s technique is based on injecting multiplied cells - like TRC. » technique is based on injecting multiplied cells - like TRC. This is interesting, my question is, if ARI is using a scafold in their process… would this be considered as proto-hairs? » process… would this be considered as proto-hairs? The term “proto-hairs” was coined by Intercytex for the treatment which will grow complete follicles in lab (they had a picture of proto-hairs in that report too), and then tranplanting them to the scalp. I don’t think proto-hairs is appropriate for ARI since they aren’t really tranplanting anything solid/hair-like. They will either inject multiplied cells in the scalp, just like TRC…or they will inject the cells in a scaffold allowing a properly directed follicle to form. However, it must be noted that the latest text on their website specifically talks about rejuvenation. If they are pursuing rejuvenation - which I suspect they are, it’d be the best treatment out there. Why? because you already have a follicle in place - the one old, minitaurized now. They’ll inject new cells into the root of that old follicle and it’ll start producing terminal hair again. This way you don’t have to worry about direction issues, or creating more follicles on someone’s scalp, which equals more sebaceous glands = more oily scalp! Follicle Neogenesis also has another downside…i.e. if the new follicles stop cycling after 4-5 years, then you’ll just end up with thousands of more minitaurized follicles on your head. If you get another round of the same treatment you end up creating more follicles. But would the scalp even allow such unregulated addition of follicles…what’s the saturation point after which the treatment’s just won’t work? we don’t know. Thats why I never really like neogenesis. I remember Intercytex also claimed both neo-genesis & rejuvenation but from what I can tell, they couldn’t quite understand what conditions cause neogenesis and what cause rejuvenation. I really hope ARI figures this out, it’ll truly give us freedom to repair our existing follicles and even get top-up treatments if necessary. » guess he is no longuer a consultant. BTW - What is an “advisory board” ? An advisory board is a body that advises the board of directors and management of a corporation but does not have authority to vote on corporate matters, nor a legal fiduciary responsibility. 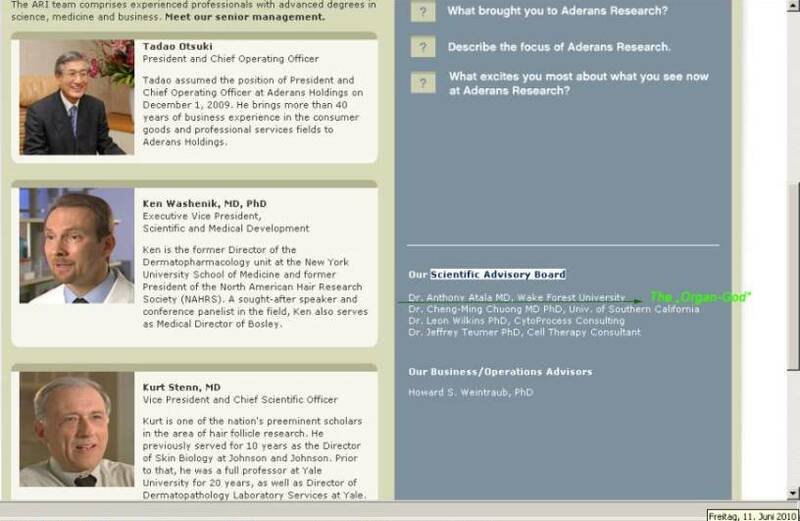 The short video on their website says “this is a cellular hair transplant to augment a traditional hair transplant. It creates new follicles by injecting your own hair cells back into the patients scalp”. » » process… would this be considered as proto-hairs? » that report too), and then tranplanting them to the scalp. » scaffold allowing a properly directed follicle to form. » which I suspect they are, it’d be the best treatment out there. Why? » equals more sebaceous glands = more oily scalp! » never really like neogenesis. » top-up treatments if necessary. The short video on their website is about 5 years old! » The short video on their website is about 5 years old! +1…Also, I was going by the latest wording on their website “rejuvenation”. They’ve always used the term “neogenesis” - like they do in that old video as well. But for the first time they’ve used the term rejuvenation on their website. If they are really working/focusing on rejuvenation or if its a mix-up by the webmaster…I don’t think anybody knows at this point. ITS ON THEIR UPDATED WEBSITE! » » The short video on their website is about 5 years old! » ITS ON THEIR UPDATED WEBSITE! Yes, but the video is OLD…I remember seeing this video in 2006. Much of the content of their website is still old…some is new. » knows at this point. I am not concerns about the video (6y old) as much as their new strategy about rejuvenaton vs noegenesis which seams to have changed over the years. My guess is that they get better results with rejuvenation than noegenesis. Because back in 2006, they main focus (base on internet interview a while back) was on noegenesis and rejuvenation was an added bonus. As to which one is best. It all depends on the final look after going from NW7 to NW0. it is just speculation.